Who Are The 24 Elders? There has been a lot of discussion of late concerning the identity of the 24 Elders first introduced in Revelation 4. Who are they? What are they doing in Heaven? The answer is surprisingly important, because, if they in fact represent the glorified Church, Revelation 4–5 suddenly becomes another overwhelmingly powerful, if not definitive proof-text for the pre-tribulational rapture of the Church. Even within the pre-trib community there is a substantial difference of opinion regarding these two chapters as it pertains to the timing of the opening of the seals and the identity of the elders. I respect both views, but am persuaded on the preponderance of evidence by the traditional, pre-millennial, pre-tribulational view which teaches that Christ begins unsealing the seven-sealed scroll after the rapture (you can read my general teaching on the subject here). So who are the elders? I see some offering opinions based almost exclusively on patterns and foreshadows, but I want to know if Scripture gives a more definitive answer. Scripture is replete with patterns and incredible symmetry and we must be careful not to turn those patterns into something they are not. Jacob had 12 sons and Jesus had 12 apostles, but that doesn't mean Jesus' 12 apostles are the re-incarnation of Jacob's 12 sons. It just means that the Sovereign God we worship is orchestrating everything into an incredible symphony of eternal significance. He is the God of order, not disorder. Likewise, King David established 24 priestly courses in 1 Chronicles 24, but that doesn't mean the 24 elders are Israelite priests or Jewish saints of old. It's just a pattern (but an important one as you'll see in a minute). Keeping patterns in mind, but setting them aside to first see if God's Word gives a more definitive, literal answer is, in my humble opinion, the proper way to properly divide Scripture. So what do we know about the 24 elders? They are first introduced in Revelation 4:4, just after John is raptured to Heaven at the sound of a trumpet (Rev. 4:1; c.f. 1 Thess. 4:16–17; 1 Cor. 15:51–52; see also regarding the door in Heaven Jn. 10:7, 9; 14:1–6). The Greek word for elder, presbuteros, is used exclusively of men in Scripture (54 times before Revelation and 12 times in Revelation). These are not angels or some other sort of creature. In fact, there is no scholarly debate that I am aware of to the contrary. The elders are human beings. But more than just human beings, elders are rulers—in the gospels, members of the Sanhedrin; and in the epistles, leaders of local churches. When we first encounter the elders in Revelation 4:4 we see that they are 1. seated on thrones, 2. dressed in white, and 3. wearing victor's crowns. We also see that the elders are glorified and enthroned before the Lamb begins to unseal the scroll in Revelation 6:1. Regarding the first and fourth points above, one might argue these are not very relevant to identifying the elders. After all, perhaps the seals began opening shortly after Jesus ascended to Heaven and the elders were already seated way back then. And perhaps the elders were seated before John was raptured to Heaven. I won't argue those points because I believe they fall into place on their own once the other evidence is investigated. So we are left with the 24 elders being a group of glorified human beings who 1. wear victor's crowns, 2. rule, 3. wear white raiment, and 4. sit on thrones. ...Be faithful unto death, and I will give you the crown of life. To the one who is victorious and does my will to the end, I will give authority over the nations—that one ‘will rule them with an iron scepter and will dash them to pieces like pottery’—just as I have received authority from my Father. Side Note: Christians are promised white garments and the elders are also wearing white garments (himation). These are not robes, whereas the Tribulation Saints in Revelation 7:9, who come out of the Great Tribulation (Rev. 7:14) and are resurrected after the Church is reigning on thrones, after the Tribulation (Rev. 20:4), are wearing white robes (stolé). This is an important distinguishing factor between the elders and the Tribulation Saints. Furthermore, the fact that those ruling on thrones are already seated before Tribulation Saints are resurrected, as Revelation 20:4 explicitly says, is another important piece of evidence supporting the pre-tribulational rapture. Also, compare the 5th Seal Martyrs (Rev. 6:11) with Revelation 7:14 and Revelation 20:4. The 5th Seal Martyrs (a.k.a. Tribulation Saints) are a unique group of mostly Gentiles, distinct from the Church, who are exclusively killed via beheading. These are not the Church of the Firstborn. The Scriptures are explicit. And here's the real clincher: whereas overcoming members of the Church are promised white garments (himation) in Revelation 3:5, the 5th Seal Martyrs are promised white robes (stolé) in Revelation 6:11! And then in the following chapter we see those same 5th Seal Martyrs resurrected and wearing their promised white robes (Rev. 7:9). Also it [the beast] was allowed to make war on the saints and to conquer them. And authority was given it over every tribe and people and language and nation. The Holy Spirit-indwelt Church is the current restraining force in the affairs of man and will never be conquered. That's why no matter how bad things seem to get, the Church keeps spreading and lawlessness is never given absolute free reign. Just think about the 2016 election. Many thought it was all over. A Clinton win would have sealed the Supreme Court indefinitely and we would be well on our way to true U.S. and global tyranny... but evangelicals showed up at the polls by the millions. The male child of Revelation 12:5 is the restrainer and satan can't have his way until we're gone. The saints and elect of the Tribulation, with the exception of the remnant of Israel in hiding, are a different matter. They will be conquered and all beheaded. The elders have himation, crowns, and thrones, and are seated before the Tribulation Saints are resurrected. The Tribulation Saints have stolé, palm branches, no crowns, no thrones, are all killed via beheading, and are resurrected after the elders are seated. Scripture is explicit. God is not a uni-personal god of homogeneity and Babel brick-making. No, He is the tri-personal God of diversity and family. He makes kinds. He uses stones—each one being unique. Within the Church Jews and Gentiles are one, but this group is composed of Jews and Gentiles from the present age only. Israel is not the Church and the Tribulation Saints are not the Church, either. There are three different groups. We are all grafted into the same family of faith, with Christ Himself the head, but in any family there are different members and roles. 1. Is there anything else that more explicitly connects the elders with the Church? YES. While the previously discussed passages offer strong circumstantial evidence that is perhaps stronger than any arguments to the contrary, there is still one passage that I've saved for last because it is conclusive: Revelation 5:8–10. After John is raptured in Chapter 4 and the 24 elders are introduced, we then learn about the four living creatures and the Lamb is given the seven-sealed scroll. In response to the only-one-who-is-worthy Lamb being given the scroll, the four living creatures in unison with the 24 elders sing an antiphonal song in worship to the Lamb. The song identifies the elders with the Church in verses 9–10. 10 And have made THEM unto our God kings and priests: and THEY shall reign on the earth." Verse 8 tells us that both the four living creatures and the 24 elders are together and given harps. Verse 9 opens with both groups singing a song to the Lamb. The manuscript evidence suggests the elders sing verse 9 because of the pronoun hemas ("us") and the living creatures sing verse 10 because of the plural third person pronoun autous ("they"). This is an antiphonal symphony of worship. The King James Version and Young's Literal Translation are more accurate than modern English translations in this passage, correctly translating "us" in verse 9, but they make a mishap in verse 10 by adding "us" there, as well—failing to notice that the living creatures are also part of the song. Either way you slice it, the 24 elders positively identify themselves as those who have been redeemed by Christ's blood "out of every kindred, and tongue, and people, and nation." To take this verse literally we must conclude that 1. The 24 elders constitute both Jews and Gentiles, 2. The 24 elders represent a group of far more than just 24 individuals, and 3. The 24 elders are a blood-bought group of believers. Furthermore, the living creatures positively identify the 24 elders as both kings and priests—from the heavenly perspective, aside from God Himself, rights reserved for the Church alone (e.g. 1 Pt. 2:9; Rev. 2:26–27; 3:21; 12:5). 2. Do the 24 elders represent more than just 24 individuals? First, the Church is a unique group composed of both Jews and Gentiles. The Jews come from the 12 sons of Jacob and Gentile believers came to faith through the preaching of the 12 apostles of the Lamb. Jews and Gentiles together can therefore be symbolized by 12 + 12 = 24. We see this pattern in Revelation 21 with New Jerusalem which has 12 foundations and 12 gates. The 12 foundations are inscribed with the names of the apostles and the gates are inscribed with the names of the sons of Jacob. The number 24 is thus a perfect symbol of the collective Church. Second, in 1 Chronicles 24 we learn that King David created 24 divisions or courses of priestly duty in the Temple. The positions were held on a rotating basis so that no one priest held the position indefinitely. In other words, over the course of time, everyone would get a turn. Third, in 1 Chronicles 25 King David did a similar dividing into 24 of the singers and musicians who would perform worship in the Temple. There were 288 musicians total and King David had them divided into 24 divisions, so similar to the previous chapter, 24 symbolizes the whole group. It could be that the 24 elders symbolize the entire Church, or it could be that John literally saw 24 elders appointed from the Church and a similar rotating service takes place in Heaven as what happened in the Temple in King David's day. Either way, the 24 elders represent the entire Church of the Firstborn (of which you and I, by God's grace, are a part). Finally, since the 24 elders must necessarily include Gentiles (Rev. 5:9), and the resurrection and glorification of Gentiles first occurs at the rapture, we can conclude that the 24 elders were not seated prior to the rapture. However, they are clearly seated prior to the resurrection of the 5th Seal Martyrs/Tribulation Saints per Revelation 20:4. 1. The 24 elders are not angels. 2. The 24 elders are not a group exclusively composed of Jews. 3. The 24 elders are a group of redeemed Jews and Gentiles distinct from the primarily Gentile multitude of Revelation 7:9. 4. 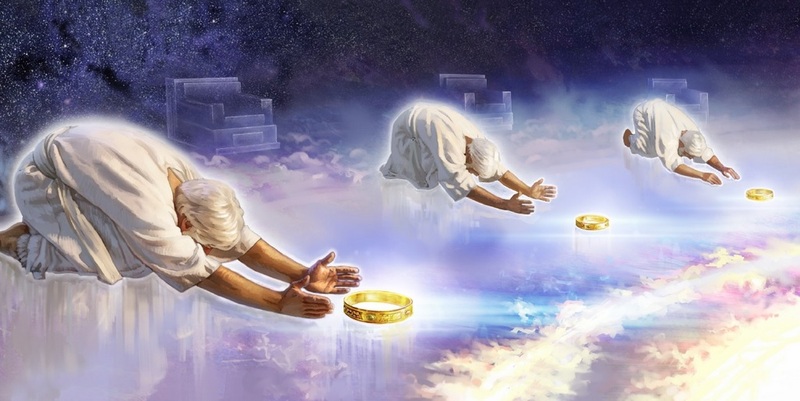 The 24 elders, redeemed from the earth by the blood of the Lamb, are resurrected, raptured, and reigning in Heaven before the resurrection of the 5th Seal Martyrs/Tribulation Saints. 5. The 24 elders, constituting a group "from every kindred, and tongue, and people, and nation," can be redeemed and enthroned no sooner than the pre-tribulational rapture. Since I believe in a prima facie reading of Scripture, I believe John literally saw a vision of 24 members of Christ's mystical body seated on thrones in New Jerusalem. They were seated shortly after the rapture and the rapture is pictured in Revelation 4:1. As many have noticed, the ekklesia (church) is mentioned 19 times in the first three chapters of Revelation, but is strangely absent from Revelation 4:1 on to the very end of the book, with a single mention at the very end (Rev. 22:16). The reason is obvious enough: because John caught a glimpse of the end of the Church Age in Revelation 4:1 and the Church on earth was raptured and glorified and henceforth pictured as the reigning elders (who happen to be pictured possessing the things promised by Christ to the overcoming believers in Revelation 2–3). They make heavenly appearances throughout the rest of the book, appearing in chapters 4, 5, 7, 11, 14, 19, and by inference in chapter 20 verse 4. And consider this: in Chapter 15 of my 2011 book Some Things You Should Know, I calculated a rough estimate of the number of Christians who have lived and died over the last 2,000 years to be about nine billion. This estimate doesn't factor in apostates, false converts, and pseudo-Christian sectarians from before 1950, so the real number is closer to half of that. Considering again that the 24 elders represent the Church, it just so happens that 24^7 = 4.5 billion, right in line with my estimate. Wonderful article, thank you Gary! You're most welcome! I hope this helps explain an enigma, which is actually not much of an enigma, after all! @Unknown, that's a good question. Remember that the pronouns in 5:10 are "they" and, by parsing, "them." They are not singing of their own redemption, but of the redemption of their friends the elders. As far as I can see from that, these are the high class of the SERAPHIM which are only responsible for worship and praise before and around the throne of God. When they sing the song of redemption I can imagine from 1 Peter 1:12 and 1 Corinthians 4:9 how they identify with the redeemed saints and praise Gods grace that they have now got to know via the redemption of the human race. Angels do not know about GRACE, we know that from the fallen ones and from the book of Enoch. But Gods grace through Jesus Christs blood sacrific on the cross towards sinful humans (who are so much weaker in their natural state than they are) must have impressed them very much and make them praise God even more than before now. @Annabel! Yes, exactly right. Plus, Scripture says angels "long to look into these things" (i.e. redemption). There is something so incredibly profound and revealing about God's love demonstrated through Christ's sacrifice for sinful humanity, that makes angels marvel. It makes me marvel and I am a fallen human. Dear friend, this has as well always been my understanding of 12xOT Israel tribes + 12xNT Church apostles elders. The OT saints from Adam on must be included. We know that from Matthew 19:28 Blessings to you! Excellent insight into a question I have always pondered when reading Revelation: Who are those guys? Thank you for sharing! Four living creatures are the four faces of Jesus. There are 4 Gospels that reveal Jesus from 4 sides. Gospel of Matthew, Jesys is the King of the Jews (Lion). Gospel of Mark, Jesus is the perfect Servant (Ox). Gospel of Like, Jesus is the perfect Man (Man). Gospel of John, Jesus is the Son of God (Flying Eagle). The distinction you made between garments and robes is interesting, but I am not sure that it points to a difference between the "pretrib raptured" church and "tribulation saints." Technically a white robe is a garment and a garment can be a robe. Also, Revelation 22:14 reads, "Blessed are those who wash their robes, that they may have the right to the tree of life and may go through the gates into the city." So this verse says that those in robes (not white garments) have the right to the tree of life. The letter written to the church in Ephesus is also told they will be given the right to the tree of life. Therefore the ones in white robes (not the word for garments) and the church of Ephesus are told they will be given the right to the tree of life. Does this mean the church of Ephesus is going through the tribulation? In regards to Revelation 22:14, “ Blessed are those who wash their Robes...” is not in a couple of my bible versions. KJV, NKJV do not say anything about robes being washed ( and the Strong’s concordance does not reference either. ) These books read it as “Blessed are they that do his commandments...” and no mention at all of robe washing. Now it does mention robe washing in my NASB and of course the ESV. So I guess this is question for the Greek Geeks. What does the original text say??? @Unknown, if the original text uses different terms for the same thing this is on PURPOSE and always has a specific meaning. So indeed these two "garments" and "robe" are distinct because one is from church age = solar gratia, grace ALONE and one is from tribulation period = grace + works (Rev14 eternal gospel) the works are here: being beheaded for not taking the mark and bowing down to the AC. Yes, agreed! God's Word doesn't make arbitrary distinctions. Every word has purpose. True every word has a purpose. But perhaps the word robe is used just to emphasize and set apart the blessed saints who were martyred for their faith or who went through the great tribulation. The book of Revelation makes mention of this special group a lot and they are given the right to the tree of life in Revelation 22:14. Revelation 19:8 says that after the church has already been in heaven for some time (hopefully clothed in something), they are then given fine linen, bright and clean (Revelation 19:8) to be worn at the wedding of the Lamb that comes after tribulation. This linen attire is not specified as a robe or a garment, but it seems to be a new article of clothing the bride is given to wear. This is also what is worn by the saints when they join Jesus in the armies from heaven at the battle of Armageddon. I do find it interesting that the garment given to the tribulation saints, is a garment worn by kings and priests and the upper class, according to sources I read. The garment that the 24 elders is wearing however is a garment worn by the ancients and does not seem to be specifically associated with a particular class of people. Why are we even going to need clothes? I am quite happy to elicit a laugh, as I am normally a bit of a comedian. But seriously, why would our glorified bodies need to be covered up? I guess it's just part of the plan. Will there be fashion in heaven too? Sorry I just get a lot of questions when I see this stuff. Maybe I just over-spiritualize it. :-) I guess I just assumed because Adam and eve were naked before the fall, that naked was the natural state. When the disciples saw the Lord later in the day on Resurrection Sunday, I don't recall any of them saying, "Dude, like get some *clothes* on, you know?" Thus I assume that Jesus was clothed in the usual way. It's interesting that what struck them about Jesus wasn't so much His physical appearance per se, but the simple fact that He was ALIVE and speaking with them after being very much dead over the weekend. Miguel, Adam was created by God and Eve also but He used Adam's rib. So, they had a perfect, sinless body and they lived in a perfect environment until they sinned and Good removed them from the Garden of Eden. And, their bodies now die as ours. Their bodies now need to be redeemed and glorified as ours. So, I think we would need clothes - just saying here. After all, when Jesus returns to Earth with His army and His redeemed they are all have on white raiment. And, when Jesus ascended as He was lifted up in front of His disciples, and I believe Jesus was talking to them, surely He had the clothes of the day on as He rose up into the Heavens. He now gave up His form before becoming a human being and thus forevermore Jesus will have a human body. Another reason to love the sacrifice He made for us. Not too sure about sandwiches and coffee Greg L but Jesus did eat a piece of fish. Sorry, I had "Good" removed ... Instead of "God". P.S. Miguel, I guess I want clothes on. Maybe they dry automatically and never get dirty and stay clean. Cathi, Greg, Annabel, thanks for humoring me and taking the time to help me understand better. It makes sense. There's just so much in the Bible that I have not understood completely or have misunderstood and also so much that I think I have over-spiritualized over the years. I'm glad this is a place where I can ask the odd questions. Thanks again my siblings in Christ. Thank you Gary! This is really great! I'm praying to the Lord continually the last weeks about this issue! Your article is incredible! I think now if it's an answer of the Lord to my prayer! Very much blessings to you and all your team here! Maranatha! Wow Alla! That's so awesome that you were praying about a specific answer about the elders. God answers prayer! In the KJV it says "And hast made us unto our God kings and priests: and we shall reign on the earth" and the us appears to refer to the 24 Elders as being made Kings and Priests. The same issue exists with other translations. Could it be both, or are we missing something? Yes, very good point! This goes straight to the pronoun question. The KJV gets it right in verse 9, but wrong in verse 10. The NIV is just the opposite, getting it right in verse 10, but wrong in verse 9. In almost all of the Greek manuscripts, the pronouns are "us" in verse 9 and "they" in verse 10. Sorry, the point I was leading to with that is that many English translators make presumptions rather than translate literally. In this instance it's because they're not factoring in verse 8 and 9a where we see that the elders and living creatures are BOTH singing. Exactly. The pronoun issue in Revelation 5:9-10 is critical to a proper understanding of who the 24 elders are, and the actual manuscript evidence is overwhelming in its support for first person "us/we" in verse 9, and third person "they/them" in verse 10. And yes, the beloved KJV got it wrong on this, as do most modern translations. This is why people who have other (typically non-pre-trib) interpretations of Scripture invariably capitalize on the smoke screen of "confusion" that has grown up around the choice of pronouns in these two verses--it's their best shot. That relieves them of the burden of actually *proving* anything--this enables them to simply kick up a little puff of doubt. And yes, verse 8 makes it clear that the four living creatures are taking part in the singing, but they *cannot* sing verse 9. Only the human elders can. The four living creatures *can* sing verse 10, however, and that is apparently what is happening. It's antiphonal in nature, which fits the entire scene of chapter 5 extremely well as you read the whole thing. After devoting not one but two articles to the 24 elders, I am satisfied that their identity as the raptured Church is an open and shut case. Nothing else fits. Nothing else makes sense in the light of everything we can garner from Scripture. Every single argument for them being anything or anybody else ultimately falls apart. "That which hath been is now; and that which is to be hath already been; and God requireth that which is past." A pre-trib Revelation 4:1 rapture is pretty darn conclusive. One really has to perform some scripture gymnastics and do some major contorting of scripture to conclude a mid or post tribulation rapture. "So we are left with the 24 elders being a group of glorified human beings who 1. wear victor's crowns, 2. rule, 3. wear white raiment, and 4. sit on thrones. These four pieces of evidence come just four verses after Jesus' messages to the seven churches. Well guess what? These four attributes are the exact things promised by Jesus to the members of the churches who overcome the world through faith alone:"
Thank you for pointing this out. It really opened my eyes. "Scripture is replete with patterns and incredible symmetry and we must be careful not to turn those patterns into something they are not. Jacob had 12 sons and Jesus had 12 apostles, but that doesn't mean Jesus' 12 apostles are the re-incarnation of Jacob's 12 sons." THANK YOU for so clearly making this point. I've seen this happening a lot but haven't been able to put my finger on it so precisely. I'm fascinated by the raiment vs. robe and definitely plan to study that more. Great job, Gary! You are a blessing! Thank you sister! And you are full of grace and truth. I've added some additional sections, btw, including a summation towards the bottom! You wrote Gary - "Who are they? What are they doing in Heaven? The answer is surprisingly important, because, if they in fact represent the glorified Church, Revelation 4–5 suddenly becomes another overwhelmingly powerful, if not definitive proof-text for the pre-tribulational rapture of the Church." "Come up here and I will show you what must take place AFTER THIS." Elgordo :) Thank you :) It very well could be. At this point I do not believe that the multitude in Rev. 7 is the age of grace Church, as I considered before, primarily due to the fact that our robes are washed by Jesus Himself (Eph. 5:25-27 & Rev. 1:5) and Rev. 7:14 says "they washed their robes." However, this still leaves many open ends for me, so the study continues. I am definitely not dogmatic about an age-of-grace church rapture at the 6th seal and if I get enough material together I may do an updated article, but at this point there are some loose ends I'd prefer to tie up first. I loved how you united the picture of the 24 elders with the promises to overcomers made by Christ previously to the seven churches. That connection flows flawlessly within the letter even though the case can also be made from other New Testament verses that these men represent the church in regards to clothing, crowns and thrones. Beautiful. I concur with you but do have to point out that regardless of the outcome of the 2016 election, that we and the rest of the world were already, "well on our way" to true "global tyranny." An imminent departure of the church means an imminent rise of the AC does it not? I think it's safe to say we're well on our way already and that started some time ago. Yes, yes! That's true, but again, it can't happen until the restrainer is removed. So it's true that satan is putting all of his players in place in preparation for the final confrontation, but God is still ultimately sovereign. Gary - great write-up again, thank you. I want to ask the question however "isn't the 24 Elders being the Church a moot point". My rationale for asking the question is this: When did God appoint the 12 rulers of Israel for ruling in the Millennial reign? at the start of his ministry, or simply prior to the Millennial reign? The answer is he appointed them at the start. When the disciples were called to ministry, they were also appointed unto rulership. Jesus didn't have to wait until all Jews had been saved and brought into his kingdom to make the appointments, as he declared it into being at the very beginning (or at least partly though his ministry)! So my point is this. Appointing 24 Elders to represent the Church doesn't automatically mean that they represent only the raptured Church. An allocation of Elder rulership at the start of his ministry (or even throughout the current Church age) is totally feasible, and I can't see anywhere where the Elders were only appointed once the church had been raptured (otherwise wording would have been clear as such). So Elders/Raptured Church is not clear from the scriptures that they are mutually inclusive or exclusive, merely (although nothing is ever 'merely' when it comes to Gods Word) that there is an alignment with the Church. So yes - I can see the 'Elders/Church' alignment, but not the 'Elders/Raptured Church' one. Dear Ryan, check Matthew 19:28 this is possibly an answer to your question! You raise a good question and Scripture is filled with lots of "already-but-not-yet" kinds of promises (e.g. "hidden with Christ on high," "born again," etc). Regarding the elders, though, John captures a glimpse of them glorified *in Heaven*. They may already be appointed, but they are not glorified until the rapture. Jesus was the first man to be glorified (after He ascended), so it follows necessarily that unless there was a secret rapture of 24 select individuals sometime between the ascension and today, the elders are still awaiting their glorification and enthronement. Gary - I am still struggling with why the Elders are glorified vs believers in heaven who are currently 'not'. Romans 8:30 notes "...those he justified, he also glorified". So if we are already justified, then we are already glorified. However when we pass from this life into the next, what is the distinguishing factor between the receipt of our new spiritual and imperishable body we receive upon death, vs the one we receive when the 'dead are raised in Christ' according to 1 Thessalonians? If the answer is 'none', then the white raiment of the Elders (i.e. the glorified body) has already been bestowed upon all believers who have died and have shed their physical bodies. So can we not say without a shadow of a doubt that all believers who are in heaven as we speak in their imperishable bodies, clothed in white garments which have been washed in the blood of the lamb, and are therefore 'glorified'? No secret rapture of the 24 elders therefore needed?? Annabel - forgot to note that the day we are totally free from the torment of sin will be the most glorious day of all, amen to that!! hope you don't mind me adding something here (and it may be too late anyway!). But there are NO believers in Christ that are 'glorified' yet. I know Romans 8:30 speaks of glorification in the past tense but that is ONLY because it is completely certain for those that God has justified so it is seen as already accomplished in God's view. 'Glorification' is the final act of salvation where the believer is changed completely into Christ's image and glory with no sin ever present again and this includes the new resurrection body. The Bible says this happens when Christ returns. Col 3:4 When Christ, who is our life, is revealed, then you also will be revealed with Him in glory. 1Jn 3:2 Beloved, now we are children of God, and it has not appeared as yet what we will be. We know that when He appears, we will be like Him, because we will see Him just as He is. All believers throughout the church age will be glorified TOGETHER at the SAME time when the Lord returns. "Note carefully that no saints will ever be crowned until the apostle Paul receives that crown of righteousness which the Lord revealed to him as his reward. In 2 Timothy 4:8 he says: “Henceforth there is laid up for me a crown of righteousness, which the Lord, the righteous judge, shall give me at that day: and not to me only, but unto all them also that love (or have loved) His appearing.” The expression “at that day” refers to the day of Christ when He will come for His own, and they will all be confirmed before His judgment seat. He says: “Behold, I come quickly; and my reward is with me, to give every man according as his work shall be” (Revelation 22:12). Surely it follows then that no rewards are given out until He returns for His saints. Therefore there can be no crowned elders in Heaven until after the rapture." Hope this helps. Either way, have a good day! - one of the other main 'crowns' is the 'imperishable' crown noted in 1 Corinthians. This doesn't have any disclaimers attached to it (e.g., evangelism, persecution etc), but simply noted as being 'imperishable/incorruptible'. Some argue that this is simply noting that one of the other crowns we will receive will be imperishable, and others argue that it is a separate crown. - It is suggested that the crowns of righteousness and crowns of glory will be issued at the Lords 'appearing', but others it is not quite explicit. We assume through other wording that the crown of rejoicing will be issued as a reward when the other rewards are distributed, but nothing on the imperishable crown or crown of life. - that all crowns we receive are only going to be distributed at the appearing of Christ. There are a few things wrong with this consideration. Firstly - we are rewarded with 'eternal life'. If we receive eternal life the moment we believe, then would it not be unusual for Christ to reward us with eternal life during the distribution of rewards, when he has promised it to us the moment we believe? Some would note that this would align with the 'imperishable crown' (imperishable as it is eternal). - Romans 6:23 notes that the gift of God is eternal life. Referring above, what is a gift vs reward. Could we ask if there is a crown that will be a gift vs reward (something allocated by salvation vs something aligned with faithfulness in a certain area (e.g., persecution, evangelism). We also know that rewards can be lost but salvation cannot be. - Finally - when does the judgement a the bema seat of Christ take place? Some use Revelation 19 to argue that it takes place immediately after the rapture and prior to the wedding feast. However the 'fine linen, bright and clean' noted in vs 8 only notes clothing, not crowns. Some would argue that the final distribution of rewards will take place at the same time as every man and woman is judged (Revelation 20), well after the rapture. Revelation 20:4 is particularly interesting "I saw thrones on which were seated those who had been given authority to judge". Thanks Ryan. You raise some good points. - Concerning eternal life vs crowns: I think you have answered your own question. One is a gift of grace at salvation, the other are rewards for faithfully running the race in whatever form that takes. It is true as you say that eternal life is seen as both a present gift and reality as well as a future reward (for example: John 5:24 vs Mark 10:30, Rom 2:7) but this is because eternal life is more than a length of time - Jesus is life so eternal life also speaks of our experience of Him. 1Pe 5:4 And when the Chief Shepherd appears, you will receive the unfading crown of glory. Rev 22:12 "Behold, I am coming quickly, and My reward is with Me, to render to every man according to what he has done. You are right that by Rev 19 the bride is seen as having come through the Bema seat, with all that is not of Him burned up in the fire (1 Cor 3:13) and she herself is arrayed in all her righteous acts (as a corporate body) so most place it straight after the rapture. I understand your reluctance on identifying the elders as the raptured & rewarded Church for that has serious implications for the idea of a Prewrath rapture. I can only leave that with you to sort. But just looking at the evidence surrounding the elders alone, I believe, as Gary has pointed out, that it clearly points to a raptured, rewarded & reigning (in that they have thrones to sit on as promised) Church. No its less to argue pre-trib vs pre-wrath (as Revelation jumps around enough to cause us pause for the 'flow of a chapter', Revelation 12 a case-in-point), but my issue in when lack of clarity (or enough arguments in scripture to question an absolute statement) is still used adamantly for one case or the other. You noted yourself that "as Gary has pointed out, that is clearly points to a raptured...Church"; an absolute statement when scriptures clearly indicate problems with this (as I have pointed out above). Another oldie but a goodie is the 'we are not appointed unto Wrath' - used by both pre-trib and pre-wrath(ers) for their argument, but we know that the word for 'wrath' in greek is clearly problematic from a 'wrath of the Lamb' vs 'wrath of Hell vs eternal life', as they differ in greek. Anyway - we will spend all day discussing (gently debating) our points in this regard. If it causes us to 'search out the scriptures', then that is a good thing! Please share it with any person having similar questions about TIMING. The dimension of TIME becomes obsolete when entering ETERNITY. This is so important to consider. Blessings to you! Gary dear brother TY very much for this accurate and timely overview as we just have/had some Preterist issues discussed and other confusion to clarify on rev12daily... :-) Very fitting as a confirmation! Blessings to you, grace and peace! MARANATHA! @Sherry, I definitely agree that labels are not very helpful. Discussion and fellowship with grace is of utmost importance when the issue is not about salvation. Traditionally, true preterism is incompatible with premillennialism (just fyi). Full preterism sees all biblical prophecy fulfilled by 70 AD and partial preterism sees most fulfilled by 70 AD with all that remains being the simultaneous resurrection of believers and the final judgment. Btw, I do think a lot of the Olivet Discourse had fulfillment in the lead up to 70 AD, but only as a partial or parallel fulfillment of the greater fulfillment to come in the Trib. I actually don't think Christ coming back in a literal sense of biblical interpretation. That all just seems so farfetched (The last judgement may have already happened in the spiritual world)... I believe a lot of things really. But a few thing are for certain to me, the bible was divinely inspired (the texts are sacred), we have souls, complete faith in the word of Christ (god himself) as a spiritual guidance is the best possible awnser to our question of who we are, what we're here for, and why we exist. Charity and goodness to others solidifies your love for god through love of his people. I'm just saying, I don't want you to get your hopes up for some kind of second coming of Christ as the incarnation of the word in physical form. Then if it doesn't happen, it completely destroys your faith in God. You can believe whatever you want to there is still a path to heaven for all of you. I'm just way too skeptical to take everything about the book in a literal sense. I'm not telling you what to believe in. I personally believe once you die you immediately go to heaven or hell based on your moral/spiritual allocation in this life. I anticipate the second coming as much as anyone else, in fact i plan to become a tribulation saint. But if it doesn't happen I have complete faith his word is law regardless of what happens in this world. All I want to say. @Unknown dear friend well if this is your perspective on the true word of God then please read Acts 1:11 and 1 Corinthians 15:19 to be informed what most of us (me included) believe here for a good reason. We wouldn't be Christians at all and certainly lost if we couldn't hold fast this truth because in fact it is GOD ALONE who makes us cling to it. (Philippians 2:13) MARANATHA! President Trump and Jared Kushner are working on a peace deal with Israel and the Palestines. But how does this American peace plan fit with the antichrist from the E.U. who will confirm/enforce a peace plan with Israel and many other nations? Could it be that Trump drafts a peace plan which is handed over to a European leader to confirm it? That could be! I've thought for awhile we might witness a draft peace agreement and then shortly after the rapture takes place the AC steps up and enforces that agreement for a period of seven years. How long would the time gap be between presenting the draft version of a peace agreement and the Rapture? @Moin dear friend please take into account that in fact the ORIGIN and formation of the United States as we know it was from European settlers and immigrants. Just don't forget about this. Trumps origins / ancestors are in fact Scottish and German. @Gary, spot on! In fact I heard Amir Tsarfati recently clarify that the word for "confirmed" in Daniel 9:27 (H1396 gabar) literally means "to strenghten, EXCEED, make BIGGER THAN BEFORE" i.e. probably by allowing the building of the third temple after the rapture. Good point! Excellent! Excellent work, Gary! I agree, the evidence is pretty conclusive on this topic. I've studied on this quite a bit myself but never noticed the garments vs. robes idea. And I'd never checked into the pronoun bit, the us vs. them for that verse, though I'd had the Spirit point those verses out to me as important on this topic. I believe checking up on original language is necessary, as every word chosen is SO important. Plus, I had the idea of the 12 sons of Jacob and 12 apostles as being representative of all nations etc... but I couldn't pin it down quite as nicely as you did! Thank you! Thank you! I can't tell you how many times I read through 5:8-10 and a holy nudge that this was more important than I realized, but still glossed over it. I've learned that we must handle God's Word with extreme meticulousness and constant prayer. Every word, jot, and tittle if of utmost importance. Hats off to Greg at A Little Strength and Jeff for inspiring this article. 18 Jared lived one hundred and sixty-two years, and begot Enoch. Jared lived eight hundred years, and had sons and daughters. 20 So all the days of Jared were nine hundred and sixty-two years; and he died. 23 So all of the days of Enoch were three hundred and sixty-five years. 24 And Enoch walked with God; and he was not, for God took him. Selections from Genesis 5 regarding Jared and Enoch from NKJV. Jared was the father of he who was first to be taken by God. Father of the raptured. May we consider this in a very general sense that Jared brought rise to the raptured? We do know that Jared was left behind even though his child walked with God. "Enoch walked with God" (Genesis 5:24a NKJV) and therefore was taken on the basis of his righteousness. A righteousness that appears to have transcended that of his father Jared for we know that Jared died here on earth. The sum of Jared's life was 962-years. I wonder what Strong's has to offer on the number of Jared's days? Strong's Hebrew #962 means "to spoil, plunder". Strong's Greek #962 means "Bethabara, a place of crossing, river crossing". How about the number of Jared's years leading up to the birth of Enoch? 162-years? Definition: I take captive, captivate. Strong's Hebrew #162 means "alas, ahah". Strong's Greek #162 means "I take captive, captivate". How does (will) Satan and the AC operate? "Anti" meaning instead of, in place of. By the delusion of pride in their own power and might. He/they/it will take the truth and weave it with lies. We may better understand the nature of the beast by God's rebuke of Job in the concluding chapters of one of the most, if not the most, ancient books of the Bible. Mighty as Leviathan may be, it is still subject to the hand of the Almighty who created it. Jared was left behind after the rapture of his child. May we expect a pride-filled anti-type to come of the Biblical Jared? Sixth born in the line from Seth and his father Adam the son of G-d? Precursor to the rapture and left behind to ensnare, captivate and destroy? I have a feeling that the peace plan will be in *good* hands and carried through the time that comes after our departure. It will be via one who is steadily rising in power and has the authority to see it through. Quietly working day-by-day to insure each piece is properly placed for the coming deception. So great is his delusion that he scarcely knows that he is doing the will of the One and only Sovereign and Almighty G-D.
Like a serpent, he intently and stealth-fully moves in the shadows and in the fields to gain best position from which to strike. His prey is near and within his sight. Only the winged raptor strikes fear in it's heart. His fierce talons and beak will tear the beast to pieces; but not until the strong delusion is complete. Glory to G-D in the highest. If I am not mistaken, the name of the number "962" is "בסץ" in Hebrew and unless my Hebrew is way off translates to "in the summer". So many rabbit holes. So little time. Definition: a wild olive tree, oleaster. 65 agriélaios (from 66 /ágrios, "wild, uncultivated" and 1636 /elaía, "olive tree") – properly, a wild (uncultivated) olive tree. I sourced this one from Biblehub and question the accuracy of it. "אָבֵל" is the word "abel" and means "but". Perhaps more digging to do on that one. But if it were a reference to Elisha, I find that interesting considering the story of Elisha, his coming and rise in the Biblical narrative. The type and anti-type of which has, I think, relevance today. Even if Revelation 5:9-10 is translated like you are suggesting, it doesn’t mean that the elders (who you reason are the pretribulation raptured church) are the ONLY ONES who this is verse is speaking about. In fact, the bible tells us that verse 10 also applies to the tribulation saints. BUT this promise also is made to the supposed “tribulation saints” in Daniel 7 and in Revelation 20 who you claim are not part of the church; and therefore, not represented by the elders. -Daniel 7:26-27, “But the court will sit, and his power will be taken away and completely destroyed forever. THEN the SOVEREIGNTY, POWER and GREATNESS of the kingdoms under the whole heaven WILL BE HANDED OVER to the saints, the people of the Most High. His kingdom will be an everlasting kingdom, and all rulers will worship and obey him. Clearly these verses in Daniel tell us that the “tribulation” saints will be given the kingdom which is handed over after the tribulation. With this, the “tribulation” saints are given the sovereignty, power, and greatness of the kingdom. Also in Revelation 20:6, we read that these same beheaded “tribulation” saints “will be PRIESTS of God and of Christ and will REIGN with him for a thousand years.” And where do they reign with him? On earth. Just like Revelation 5:10 says. So, either the “tribulation” saints are part of the church represented by the elders or they just so happen to be given the EXACT same promises as the church??? I believe these verses help support a claim that the tribulation saints are part of the church; all the saints comprise one body. Tracy, the tribulation saints CANNOT be part of the church because they're not from church age just that simple. But they will make part of the SAME REIGN / government on earth with Christ. Some will be kings, some will be priests, everybody in his individual and perfect place with the perfect task in the kingdom. EVERY glorified saint will have some part in the government and ruling over natural men. Thats what makes it so important to me to prepare for this era now. Church age was preparation to enter the literal kingdom. You know being glorified is important because natural men have now proved exceedingly that they aren't able to govern each other properly as well-meaning their intention may be / have been because of their sinful nature. The peace kingdom of Christ will still not be free from sin as the people will be natural, in the flesh. But those who RULE over them and the PRIESTS will be all perfect and SINLESS to perfectly reign with (not under, but WITH) a spotless God-king. These 1,000 years is a preparation period for ETERNITY which is then sinless at all. Blessings to you! Annabel - in the above article, it is written: "Furthermore, the living creatures positively identify the 24 elders as both kings and priests—from the heavenly perspective, aside from God Himself, rights reserved for the Church alone (e.g. 1 Pt. 2:9; Rev. 2:26–27; 3:21; 12:5)." My comment was made to point out that IF these rights are made to the Church ALONE, then clearly the tribulation saints are part of this same Church since they are promised these exact same rights (the rights of the kingdom & to be priests) in Daniel 7:18, Daniel 7:22, Daniel 7:27, and Revelation 20:6. If the claim that these rights are reserved for the Church alone is made, but then we see that in fact these rights are given to people who are supposedly not part of this same Church, then something is not correct about that claim. "God is not a uni-personal god of homogeneity and Babel brick-making. No, He is the tri-personal God of diversity and family." Mic-drop for all the homogenizers—stop blurring the clear-cut lines! Gary, your analysis is always so easy to follow and helps me immensely. Maranatha, brother. Gary, excellent analysis. Glad to see someone finally pick up on the difference between the garments and robes, and the obvious connection between the promises given the overcomers in Rev 2-3 and the elders in Rev 4. Another point, Rev 7:17 promises the tribulation saints will be led to "fountains" of living water. In John 7:37-38, Jesus said anyone who believes in Him would have "rivers" of living water flowing out of their innermost parts, signifying the Holy Spirit (John 7:39). The word for fountains indicates a well from which water is brought forth, while the word for rivers indicates a torrent or flood of water (see Rev 12:15-16). To me, this points to the unique promise we have as church age believers, the indwelling of the Holy Spirit. Also, perhaps you could clear up something about the Gentile tribulation saints. You and other watchers have said they will all be martyred. How then will the Gentile nations be populated in the Millennium? There are several mentions of them in the Old Testament, specifically Egypt and Assyria (Isaiah 19:19-25 and Zechariah 14:16-19). Zech 14:16 says, "And it shall come to pass, that every one that is left of all the nations which came against Jerusalem shall even go up from year to year to worship the King, the LORD of hosts, and to keep the feast of tabernacles." Any thoughts on this? PS: I only disagree with Walvoord about the question if the "sheep" did put their faith in Christ by recognizing the "brethren" during tribulation already. I'd say they won't recognize them nor who Christ is at all until this time of judgement. In a time when pity and compassion are completely blotted out among men their natural conscience will be rewarded (Romans 2:14-16!). But they will NOT know beforehand who Christ is nor believe in him before this judgement ocvurs. Otherwise, they wouldn't ask these questions about him or His saints in the end. The question just wouldn't make sense. A women, only three weeks pregnant and unaware of her pregnancy, has a miscarriage at home. The blastocyst that is/was her child has a soul and was known by God before her child was even conceived. Given the circumstances, you can imagine where that blastocyst ends up after the miscarriage. Fast forward X years and the dead in Christ are raised. How does that former blastocyst appear to his or her fellow Saints? Fully-formed adult? Infant? Such a fabulous article. Super interesting study on the 24 elders. Have always wondered what/who they represent and I believe your research is spot on! Thank you! Dear Gary, by reading through the cepher SIRACH (ECCLESIASTICUS) currently I want to drop some additional information about what the basis for the garments/robes and the crowns is and what these consist of: it is WISDOM OF GOD. I came across an interesting article today titled, "NASA's Parker Solar Probe set to 'touch the Sun' on historic mission"
1. "The 65-minute launch window for the mission opens at 3:33 a.m. EDT on Aug. 11, 2018." 2. "An epic journey that will take it (The probe) to within 3.8 million miles of the Sun’s surface, according to the space agency. This is seven times closer than the previous closest spacecraft..."
3. "Parker will complete seven flybys over seven years to gradually bring its orbit closer to the Sun." There are several things that catch my attention there. Remarkable find! It is one of the latest examples how NASA tries to test the lowest IQ of people who would buy into their lies. So much ridiculous! MARANATHA! "And consider this: in Chapter 15 of my 2011 book Some Things You Should Know, I calculated a rough estimate of the number of Christians who have lived and died over the last 2,000 years to be about nine billion. This estimate doesn't factor in apostates, false converts, and pseudo-Christian sectarians from before 1950, so the real number is closer to half of that. Considering again that the 24 elders represent the Church, it just so happens that 24^7 = 4.5 billion, right in line with my estimate." For me it is quite evident who the 24 Elders are when we combine the fact that they were raised with Jesus, who had to free them from the prison they were in and preached the gospel to them while He was in the grave. These Old Testament believers have the same quality as the rest of those who will form part of the First Resurrection - They believed that Jesus is the Son of God. Ezekiel and Isaiah who both visited the throne room of God, never saw the elders there - showing us that they were not positioned there during the Old Testament times. John and Paul, on the other hand, both visited the Throne Room of God and both saw them there, and describe them to us in Revelation and Hebrews. They occupy the most holy place in God's Temple. Just as the Temple consists of three parts, the First Resurrection as mentioned in Revelation 20, also consist of 3 parts as it represents a Harvest of Souls. The 24 elders together with Jesus form the first fruits of God's Faith harvest. The Rapture which would seem to be only days away, will include the main harvest portion. Those who find themselves left behind and in the time of Tribulation who lay their lives down willingly represent the gleanings of this harvest. The Elders are described in Hebrews 11 - the chapter about faith and this is the primary quality that defines the First Resurrection Harvest. Thanks for the read... I was amazed that I was looking for something regarding the 24 nations and found this article which perfectly matched up with my study of the 24 Elders... Like God was confirming His revelation to me... blessings!